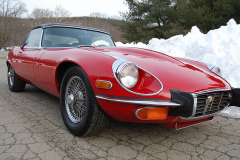 1973 Jaguar XKE Series 3 V-12 Roadster Red with a black interior. Manual Tranmission. Wire wheels. Full owners manual pouch, jack kit. This car is in very nice condition! The paint is nice and interior is as well. The engine , underside and trunk are also very clean and nice. The car has recent service history and runs out very nicely as well. If you want an excellent example of the last of the Jaguar E-type cars, this is one you should strongly consider. These cars are very powerfull and they also handle very nicely! This car has a very rare to find full owners manual pouch set which shows where the car was sold new. The car has 105,000 miles, but if someone told me the car only had 20,000 miles. I would believe them.